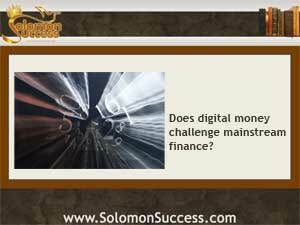 Solomon Success > Blog > Do Alternative Currencies Threaten Traditional Banking? King Solomon’s proverbs invite us to think about what money really means – wisdom, prudence and respect for God are more important than material goods. Today, the rise of digital alternative currencies like the Bitcoin are challenging people worldwide to rethink the meaning of money – and that raises fears that the mainstream rivals of those alt-currencies might find ways to shut them down. A number of organizations, especially charities, have also turned to the Bitcoin and other alternative currencies for donations as a way to bypass regulations and reporting. And because transactions are virtually instantaneous and nearly free, they bypass the usual processing delays required by credit card companies and even electronic intermediaries like PayPal.